Mendapat CPUV Nuffnang dari Mitsubishi Mirage. Terima kasih dan inilah rezeki bulan Ramadhan ..
Gambar kat atas tu ialah Mitsubishi Mirage terbaru. What makes a good light car? Is it affordability? Value for money? Fuel economy? Perhaps all three? Mitsubishi marks each of these as key attributes. 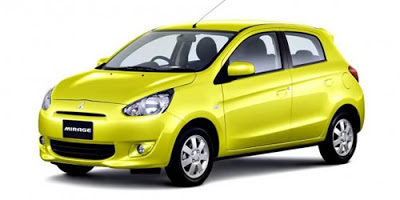 For 2013, it expects its new entrant to the light car segment - the reborn Mirage - to add significant volume to sales and arrest the company’s declining market share here. It’s hoping to shift around 1000 Mirages per month; a target that would put the Mirage in the same league as the Suzuki Swift (which last year sold around 12,000 units). 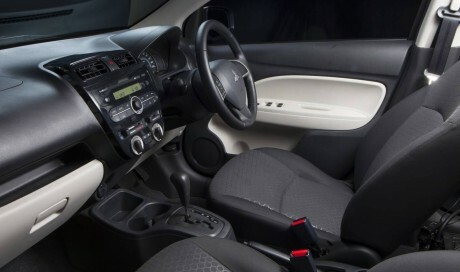 But is the Mirage as good - or better - than Suzuki’s well-sorted hatchback? It’s been nine years since you could buy a new Mirage from a Mitsubishi showroom. The Colt took the Mirage’s place from 2004 to 2011, but now the Mirage has returned to take its place at the bottom of Mitsubishi’s local range. Is it good enough to sell as Mitsubishi expects? Its entry price of $12,990 drive-away is certainly compelling, but after our first drive on local roads we’re not confident that the rest of the package is quite up to snuff. THE INTERIOR There’s no way to sugar-coat it. The Mirage’s interior looks and feels cheap. The doors close with a tinny clunk, the sunvisors are flimsy, the door cards are made entirely out of rock-hard plastic and there’s inconsistent fitment to a lot of the cabin elements. Other lowlights: a steering column that doesn’t adjust for reach, scratch-prone gloss plastics on the centre stack, manual ventilation controls that look outdated, and a rear bench seat that is flat, unsupportive and generally uncomfortable. It’s not all bad news though, for even the entry-level Mirage ES comes with a decent level of standard equipment.